Havana may be Cuba’s capital and largest city, but Santiago de Cuba is its cultural capital. 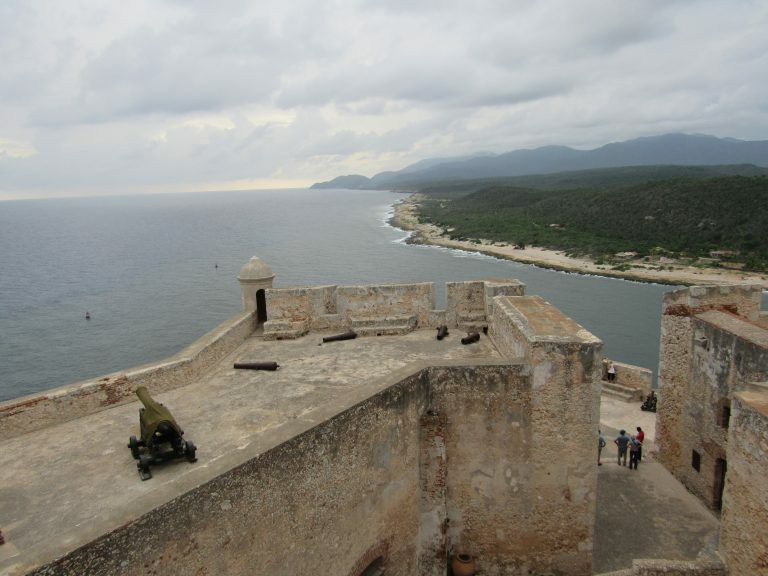 Nestled on the far southeastern side of the island, near the infamous Guantanamo Bay, Santiago de Cuba (Santiago) is the second largest city in Cuba, infused with Afro-Caribbean cultural and rebel influences. It was in Santiago, where on July 26, 1953, Fidel Castro and others launched their Revolutionary movement with a failed armed attack on the Moncada Barracks. It was also in Santiago, where on January 1, 1959, Fidel Castro proclaimed the victory of the Cuban Revolution from a balcony on Santiago’s city hall. But Santiago’s revolutionary spirit was born long before Fidel ever touched foot there. Santiago is home to Cuba’s largest Afro-Cuban population, most of whom are descended from slaves brought to Cuba from Africa and Haiti in the 1700s and 1800s to work its sugar plantations. Those slaves turned to music, dance and spirituality to survive the brutal conditions and that creolized legacy remains alive today. In what can only be described as a secret act of rebellion, African slaves disguised their religion under acceptable Catholic symbols after their traditional religions were banned. Catholic saints came to represent Yoruban orishas (divine beings), each with distinct attributes and its own color. Today, a large number of Santiagueros practice Afro-Cuban religions, most notably Santería. You’ll often see them wearing red, white, or yellow beads, with each color representing a different saint. Santiago is the birthplace of son, the traditional music and dance from which salsa dancing is derived, and guaguancó, a sub-genre of Cuban rumba, combining percussion, voices, and dance. The music permeates every pore of Santiago and you couldn’t escape it if you tried. From the local coffee shops and bars, to the legendary Casa de la Trova, Casa de la Musica, Casa de las Tradiciones, Casa del Caribe, and Patio de los dos abuelos, the intoxicating beats of Afro-Cuban music will draw you in and leave you wanting more. If you want to learn the history of Santiago’s biggest party, held each year in late July, the Carnival Museum is the place to go. You’ll find floats, effigies, costumes, musical instruments, and more from past Carnivals. If you’re lucky, you can also catch a live folklorico dance performance on the patio. They’re typically held in the afternoon around 4:00 pm, but the schedule is irregular. 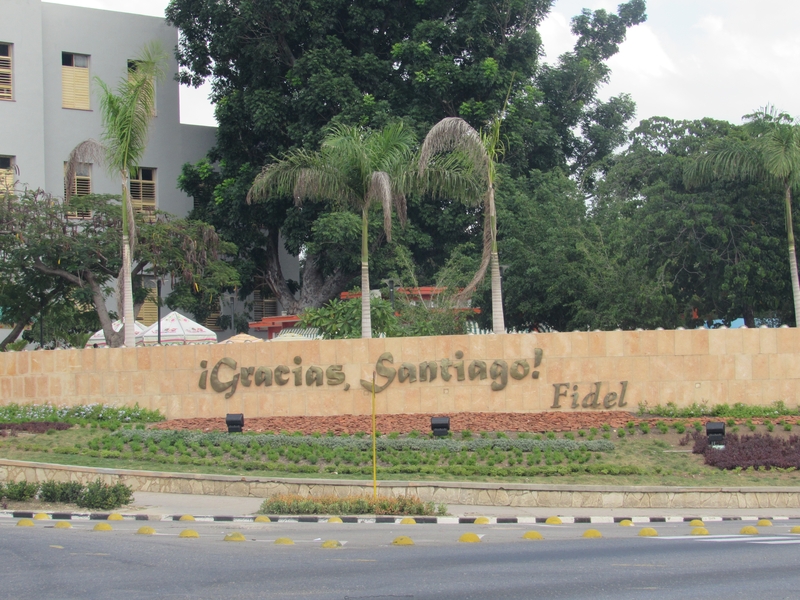 The July 26 Museum commemorates that day in 1953, when more than 100 revolutionaries led by Fidel Castro stormed dictator Fulgencio Batista’s troops at Moncada Barracks, then Cuba’s second-most important military garrison. The barracks have since been converted into a school called Ciudad Escolar 26 de Julio, and the museum is located near gate 3, where the main attack took place. There are replica bullet holes at the entrance to serve as a poignant reminder of that day. The museum contains interesting historical relics, including a scale model of the barracks, diagrams and models of the attack’s planning and aftermath, and photographs of the 61 fallen men. Built on a hill in the nearby town of El Cobre, the Monument to Runaway Slaves is a towering bronze and iron sculpture that honors one of Cuba’s earliest slave revolts that took place on July 24, 1731. The sculpture stands on a nganga (which means a metal pot in the “Regla de Palo Monte” Afro-Cuban religion), in which religious believers and practitioners place their offerings. El Cobre is located 14 miles outside of Santiago. Also located in El Cobre, this shrine celebrates Cuba’s virgin saint Our Lady of Charity, a black Madonna that so closely resembles the African orisha Ochún that many Cubans believe them to be one and the same. Known locally as “El Morro”, this UNESCO World Heritage site was built in 1638 as a military fortress to defend foreign attacks, and later served as a prison. Today, it is a museum and popular tourist attraction. This well-preserved fort has several levels of terraces overlooking Santiago Bay and offers amazing panoramic views of Santiago’s coastline. Every day at sunset there is a cañonazo ceremony (firing of the cannons). El Morro is located about six miles southwest of the city center. 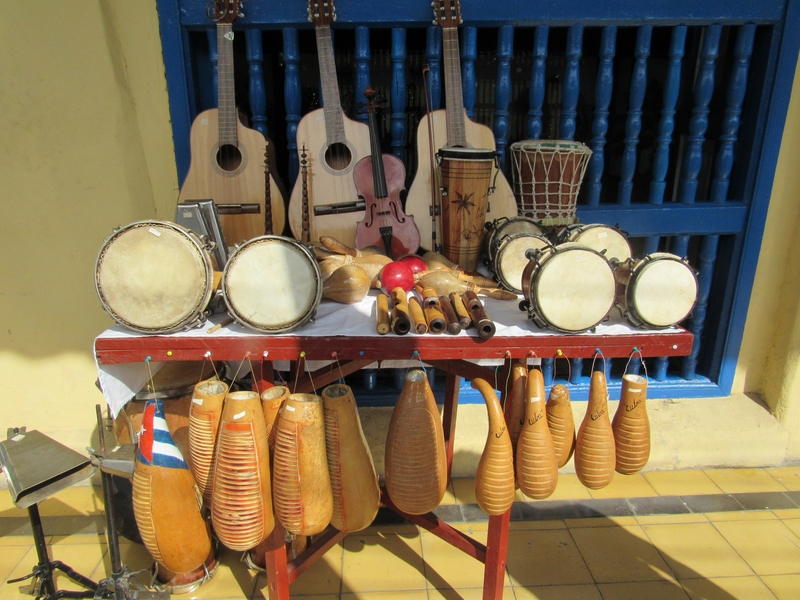 This cultural museum allows visitors to explore and learn about Cuba’s various Afro-Cuban religions, including Santería which is the most widely practiced. The museum houses a variety of religious icons, with displays symbolizing the syncretism of Catholic religious symbols with African orishas — images of Jesus Christ can be seen juxtaposed with ceremonial machetes and stuffed reptiles used in Santería ceremonies. This is the place to be on Sunday evenings from 5:00 to 9:00 pm for the weekly rumba. It’s a high energy, action packed music and dance performance celebrating the deities of Afro-Cuban religion. This cultural institution has dance lessons and events most days of the week. They also organize the Festival del Caribe and the Fiesta del Fuego every July. This square is the social hub of Santiago, where locals come to see and be seen — and to enjoy the open wifi signal. You can expect to see anything here, from live music and dance performances, to vendors selling roasted peanuts, to people walking, talking, flirting, and laughing. The square is surrounded by several colonial era buildings, including the Ayuntamiento or Town Hall, the former San Carlos Club, the Casa Granda Hotel, and the beautiful Catedral de Nuestra Señora de la Asunción (which holds the record for being the most reconstructed and remodeled building in the city). This park is the center of the Malecón (boardwalk) and features a playground, gym, palm trees and public wi-fi. It’s a great place to relax and people watch or take a stroll along the seafront. There’s even a restaurant that looks over the bay. These steps are the gateway to the Tivolí neighborhood, Santiago’s picturesque old French quarter, and one of its main attractions. The 52 steps are more than 100 years old and often the site of rousing dominoes games. This square is anchored by an impressive statue of Afro-Cuban hero and native son, Antonio Maceo. 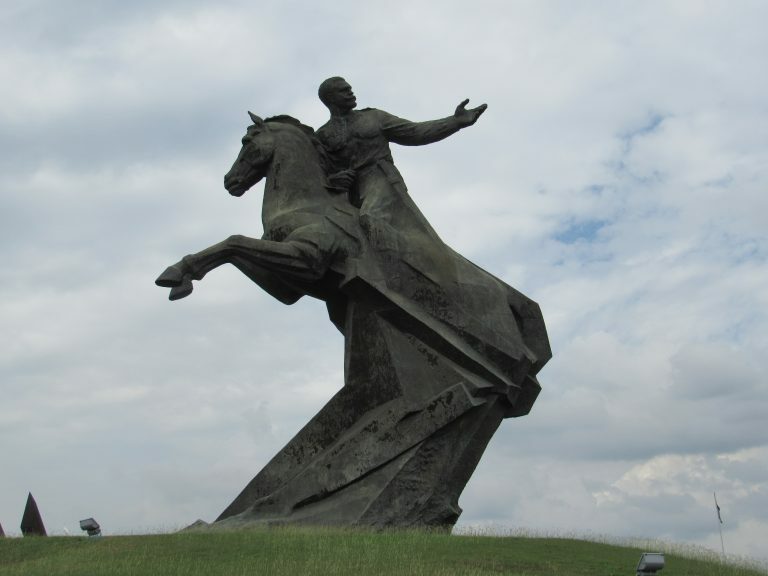 Maceo sits atop his horse and is surrounded by 23 raised machetes. There is also a small museum which contains information on his life. Directly across the street is a large billboard of Fidel Castro with the city’s motto: “rebelde ayer, hospitalaria hoy, heroica siempre” (rebellious yesterday, hospitable today, heroic always). Santiagueros are very welcoming and friendly, and they will be the highlight of your visit to Santiago. Go to the local coffee shops, parks and bars where they hang out. Play dominoes. Take salsa and rumba lessons. Chat with them and learn about their fascinating history, religion, and culture (granted you will struggle if you don’t speak Spanish since most don’t speak English; but they’ll go out of their way to try and there’s always Google Translate). Chances are they’ll invite you to their home or to a party, and you’ll leave with new lifelong friends. And when it comes to nightlife, Santiago is second to none. There is a dizzying number of bars, clubs and other venues with live jazz, salsa, son, and other Caribbean music, all of course with spectacular dancing. So let your hair down and have fun. But don’t say I didn’t warn you. Santiago is addicting. Have you been to Santiago de Cuba? What are your favorite things to do there? Share in the comments below. Although diplomatic relations between the United States and Cuba have been restored, US citizens and permanent residents are still prohibited from traveling to Cuba for purely tourism purposes. You may, however, travel to Cuba under a general license if your travel falls within one of the 12 categories of authorized travel and no prior application is required. For most people, educational activities, religious activities, support for the Cuban people, and humanitarian projects are the most appropriate categories to get there. Here are 12 things you should know before you go. Several companies offer organized People to People tours for Americans. However, they tend to be pricey and the schedules are very regimented. Those willing to make their own arrangements and craft their own itineraries can save a bundle. Commercial flights from the U.S. to Cuba resumed in August 2016, so Americans can now fly directly to Cuba instead of transiting through Mexico and other Caribbean cities. Ten U.S. airlines – American, Jet Blue, Alaska Airlines, Delta, Frontier, Silver Airways, Spirit, Southwest, Sun Country and United – now offer direct flights to Havana and other Cuban cities. have not yet resumed, so the only options are charter flights from the U.S. or connecting flights through Mexico and other Caribbean countries. Copa, Jet Blue, Interjet, Aeromexico, and Cubana all offer flights to Havana. You need a visa to enter Cuba but they’re easy to obtain. I got mine at the airport in Cancun for only $20.00. If you travel with a U.S. airline by charter, the airline will assist with handle your visa arrangements for an additional $50 to $100 80 to $90. Cuba Travel Services also offers a visa service for $85. 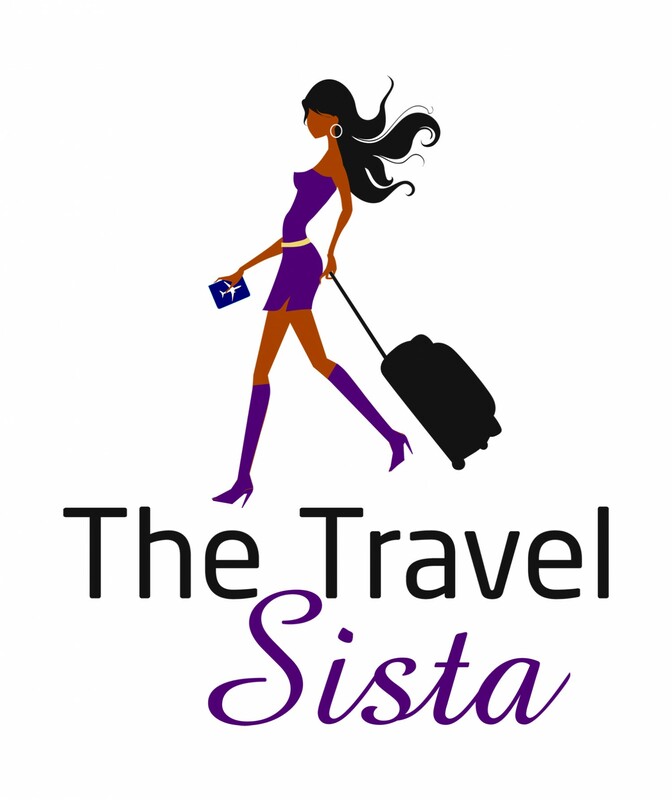 You have to fill out a form declaring that your travel falls under one of the 12 authorized categories. US-based credit cards don’t yet work in Cuba so Americans have to pay cash for everything. Cuba has two official currencies – the convertible peso or CUC (pronounced “kook”), which is mostly used by foreigners, and the Cuban peso or CUP (also known as “moneda nacional”), which is mostly used by Cubans. The conversion between CUC and CUP is 1 CUC = 25 CUP. The CUC is pegged at par with the US Dollar (USD). But there is a 10% penalty (due to the US embargo) and a 3% service charge when exchanging USD to CUC, so effectively 1 USD = .87 CUC. In order to avoid the 10 % penalty, some visitors exchange their USD to Euros before arriving. Currency can be exchanged at banks or cadecas (exchange houses), but expect a wait because lines are usually long. Some hotels will also exchange currency (and you avoid the long lines). Make sure to request small bills because most people and businesses cannot make change for larger bills. Do not exchange money with strangers on the street, as some are known to peddle counterfeit bills. If you want an authentic Cuban experience, staying at a Casa Particular (Casa for short) is the way to go. A Casa is a private family establishment that offers paid lodging, typically costing $20 to $75 per night. Breakfast may be included and many also offer lunch and dinner for an additional fee. I stayed in a private room with an amazing family that treated me like their daughter. I highly recommend it. There are various types of Casas, including private rooms, apartments, or entire houses. Cuba Junky has a full list with photos and descriptions, and AirBnb also recently started to list Casas on its site. If you prefer hotels, La Habana guide has a comprehensive list of hotels in Havana and surrounding suburbs. Cuba is not a culinary haven, but you can find some good meals at both government-run and private restaurants (aka paladares). Two of my favorite paladares were Habana 61 and 304 O’Reilly, both of which share the same name as their address. To eat on the cheap, try a government subsidized eatery or street food stall. Pizza, ham sandwiches, and a variety of fried fritters are popular fast food items. 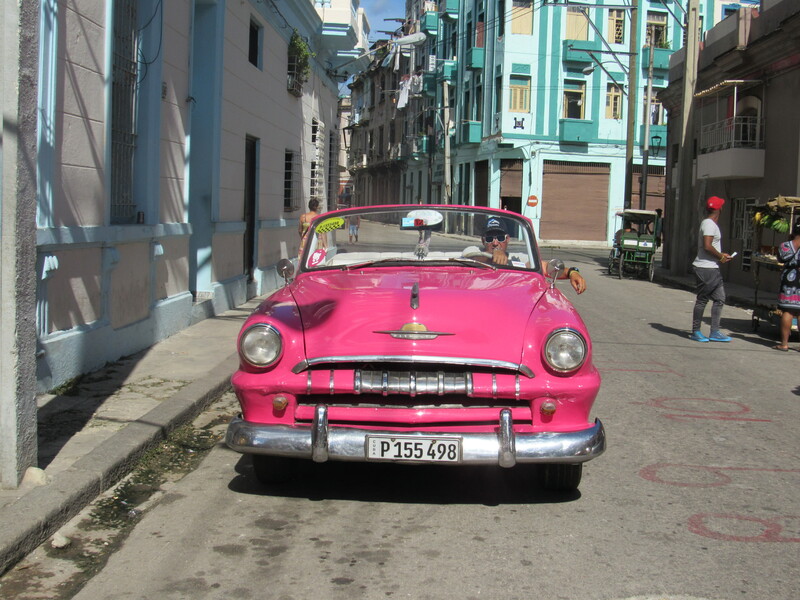 Havana is very easy to navigate on foot and walking is the best way to get oriented to the city. But if you choose not to walk, the Havana Hop On Hop Off bus is the cheapest and easiest way to see most of the city in a day, at only 5 CUC per person. The tour bus operates from 9:00 am to 6:00 pm, on a half hour schedule. The bus often runs on Cuban time (in other words, late), so patience is needed. You can catch the bus at Parque Central in Old Havana. Taxis are also a popular way to move about the city. There are several types, including bicycle taxis (aka bici-taxis), coco taxis, collectivos (shared taxis), and Cuba taxis. If you speak Spanish, you will have a huge advantage in hailing taxis. If not, be ready to negotiate and be sure to agree on a price before you enter the cab. For inter-country travel, the Viazul bus is a good way to explore the island. Tickets can be purchased in advance via credit card on the Viazul website or in person at the bus station. Even with an online reservation, you must arrive at the bus station at least one hour before departure to secure an actual ticket. You should plan to buy tickets in advance, as popular locations often sell out. The bus is notoriously cold (think meat freezer), so make sure to layer and bring a blanket. Expect to be off the grid for most of your time in Cuba. Tourists cannot buy Sim cards for their cell phones, and thus far Verizon and Sprint are is the only US carriers to offer roaming. Another option is a world phone, but rates are pricey. Tourists can access Wi-Fi by purchasing Wi-Fi cards at ETECSA offices or hotels. Wi-Fi is available only at certain hotels, which are easy to locate by the large groups of people standing outside on their cell phones. Wi-Fi can be spotty and slow, so don’t expect regular access. With roots in Afro Cuban religion, Rumba is synonymous with Cuba (Rumba can collectively refer to the music, dance, and party). One of the best places to see it is at Callejon de Hammel in Centro Havana. Every Sunday from 12 to 3pm, there is a Rumba with music, dancing, singing and religious celebration. Both tourists and locals attend and it is non-stop action. Arrive early to secure a good spot since it’s standing room only. Cuba is home to two popular drinks – the Mojito and the Cuba Libre – both of which are made with rum. Havana Club and Santiago de Cuba are two popular Cuban rum brands and both are delicious and very reasonably priced. The Havana Club Museum in Havana offers tours and rum tastings for 7 CUC. True cigar aficionados will want to visit the tobacco farms, cigar factories, and panoramic sights in Vinales. It’s only a 1.5 to 2 hour ride from Havana and can be easily done as a day or overnight trip. For those who want to stay put in Havana, you can still see cigars being hand-rolled at the Hostal Conde de Villanueva. They sell an unbranded house cigar, as well as Cohiba and other popular name brands. Cigars are a big hustle in Cuba. People will constantly approach you on the street purporting to sell authentic cigars at a discount. Buy at your own risk. Another tourist shared a story of a friend who purchased a case of cigars from a street vendor, only to find they were dry rotted and full of insects when she got home. Moral of the story – look before you buy. Cubans are experts at doing more with less. Most public locations have a bathroom attendant who rations out small pieces of toilet paper in exchange for coins (typically .25 or .30 CUC). But some places have nothing. For the ladies, I recommend packing a roll of toilet paper in your luggage and carrying some in your purse, just in case. You may want to bring small gifts for Cubans who are especially friendly or helpful to you. Many Cubans don’t have easy access to items we take for granted, like memory sticks, lip balm, feminine products, and other toiletries. Another popular item is gum (sugar-free is probably best). Three separate times Cubans asked me if I had gum and I learned they don’t have it there anymore. I gave a piece to an older man, who chewed and savored it like it was a piece of steak (as he reminisced on the old days when Cuba had American gum). It was truly a lesson in learning to appreciate the small things. Do you have any tips about Cuba? Please share them below.